Fishy Fun: Comic Characters sunk to new depths! Here's a daft but fun item for comic and fish lovers: Custom Fishbowls. This new, small British operation will take your suggestion for whatever kind of fish bowl or theme of a fishbowl you want and make it - and throw in some fish, too. One customer asked them to use a Minnie the Minx figure... And this is the result. It was clearly a commission close to the team's heart, stirring childhood memories of spending pocket money on a pack of Merlin Premier League football stickers, getting a sherbert Dib Dab and buying a copy of the Beano. "The iconic black and white stripes still evoke childhood memories of reading about Dennis the Menace, Rodger the Dodger and all the gang," says creator Joshua. 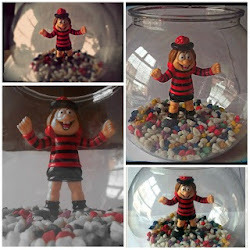 "So here's Minnie the Minx, the ultimate tomboy, finally caged ready for your goldfish to swim around. "The Bash Street Kids would be bowled over!" Future are gearing up for their launch of the Official Pokemon Magazine, with Issue 1 set to go on sale on 20th March. With entertainment content including video games, the Pokémon Trading Card Game, a TV series broadcast on CITV, movies and toys, Pokémon is one of the most popular global children’s entertainment properties in the UK. One of several 'evergreen' franchises, frequently 'reinventing' itself to gain new followers (Lego, Transformers, Doctor Who, Power Rangers could also be considered such), the Official Pokémon Magazine is the latest print launch from Future and will tap into the global Pokémon phenomenon. Future say the magazine will be a one-stop shop for everything Pokémon, providing UK fans with the ultimate guide to all the latest Pokémon video game, TV series, film and Pokémon Trading Card Game information. Each magazine will also feature activities, puzzles and competitions, and each issue will come with a Pokémon-themed cover mounted gift. 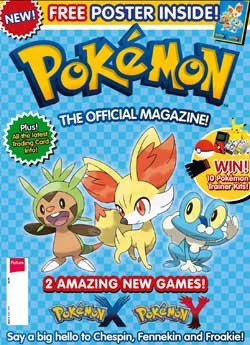 Priced at £3.99 the Official Pokémon Magazine will have a print frequency of 13 issues per year and will sit within Future’s Entertainment Group which comprises film and video game titles, including Official Nintendo Magazine and its related properties. The magazine will be edited by Editor-in-Chief, Chandra Nair. The next volume of Titan Books long-running and hugely-popular Modesty Blaise collections goes on sale on 22nd March 2013 - and we're running a competition to win a copy. Modesty Blaise is glamorous, intelligent, rich and very, very cool. She's been called the female James Bond but she's much more interesting than that. Modesty started life in 1963 as a strip in the London Evening Standard. The first of the novels followed three years later. Modesty Blaise: The Girl in the Iron Mask by the popular and sadly missed British crime writer Peter O’Donnell features three stories, drawn by Enric Badia Romero: ‘Fiona’, ‘Walkabout’ and ‘The Girl In The Iron Mask’. Willie’s admirer Fiona returns, Modesty faces the outback alone and an iron mask could mark her end in this latest gripping volume. Each story is introduced by Blaise archivist Lawrence Blackmore. 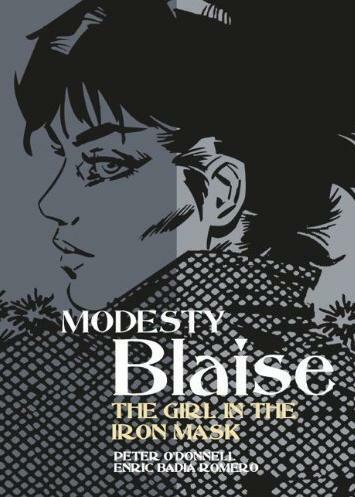 With thanks to Titan Books, we have a copy of this latest volume to give away, so we're throwing out a challenge to our artist readers - send us your drawing of Modesty Blaise and we'll choose what we think to be the very best. • Entries by email only to to johnfreeman6-mb@yahoo.co.uk, to arrive mo later than 12 noon GMT on 22nd March 2013, please. We plan to publish a gallery of the best entries and entry to the competition assumes you give us permission to do this. Good luck! Sure to attract top bidding are artworks such as Keith Watson's Dan Dare art for The Eagle Vol 15: No 46, published in 1964, in which the evil Mekon has begun a systematic destruction of London from an immense metal mushroom growing in the heart of the ciy (Lot 107). Lot 117 is a great piece of Spider art by Reg Bunn, published in 1966, in which The Crook From Outer Space becomes the Spider's evil twin, while Lot 148 is a page from Kelly's Eye published in 1972 by Solano Lopez, in which, coincidentally, Tom Kelly, owner of the life preserving 'Eye Of Zoltec' travels back in time to battle Ragnar his other world evil self. Also offered, among others, is cover art from humour comic Shiver and Shake by Robert NiXon (Lot 159); art by Eric Parker for the cover of an issue of the Sexton Blake Library (Lot 53); a smashing piece of Desperate Dan art drawn and signed by Dudley D. Watkins, published in 1952 (Lot 65), and a 1956 Topper cover by the same artist (Lot 72). 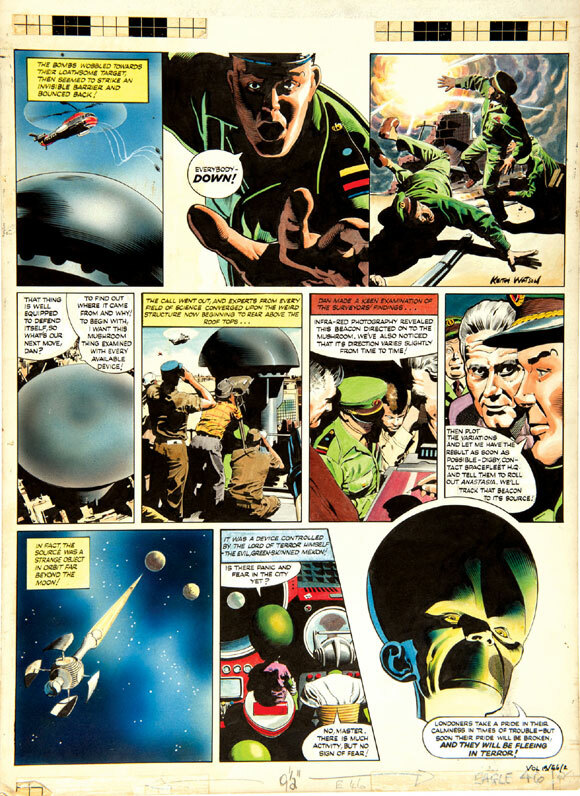 There are several Picture Library and Rupert the Bear artworks also in the auction, as well as a page from Saber, published in a 1969 edition of Tiger and Hurricane by Denis McLoughlin (Lot 96). 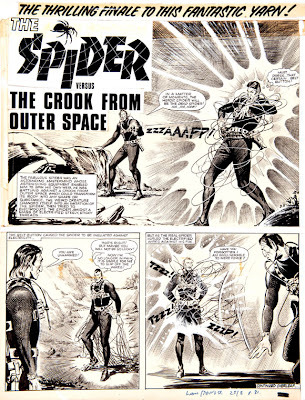 One of the stalwarts of British comics illustration, Denis McLoughlin (1915-2002) is best known for his work for TV Boardman where he drew Roy Carson, Swift Morgan, Blackhawk, The Spirit and Buffalo Bill. His 'hard-boiled detective' comic style won him legions of fans in the 40s and 50s and his work on Okay, Adventure, Buffalo Bill, Super Coloured and New Spaceways Annuals further enhanced his position. In 1967 he went to work for IPC where 'Saber', illustrated above, was his first project. 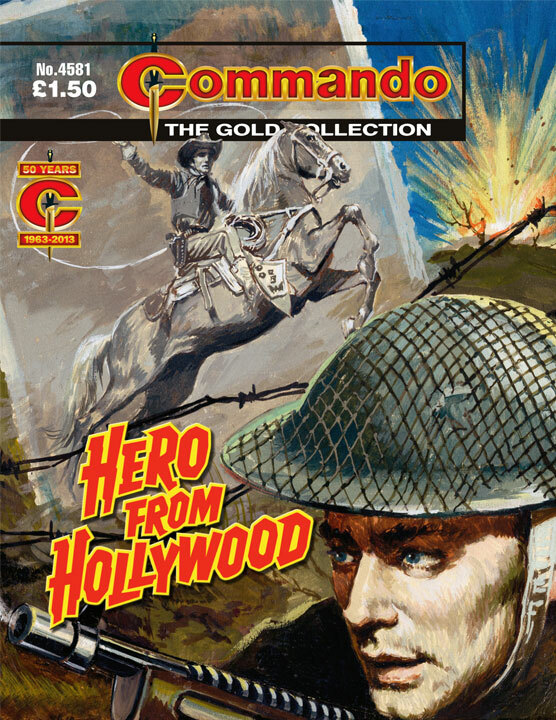 Later employed by D C Thomson, he drew stories and covers for Buddy, Bullit, Crunch, Victor and Wizard and his last work was illustrating Commando War Stories in pictures. Tragically, he took his life with a Colt revolver a week after his 84th birthday. His work is rarely seen at auction. 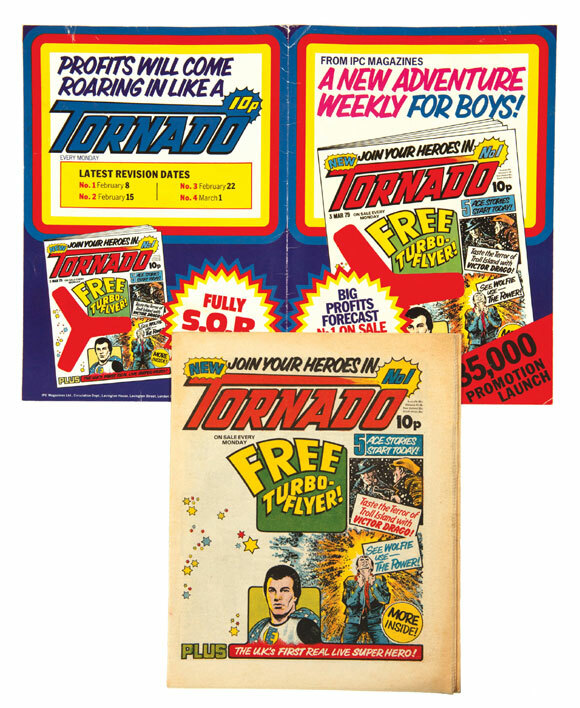 A promo copy of the short-lived Tornado - absorbed into 2000AD after just 22 issues - is among the comic rarities. The title featured artist Dave Gibbons as super-hero Big E on the cover of the first issue, posing inside with Tharg. Also on offer is a promotional issue of Whoopee, as well as other rare and sometimes elements of unpublished comics, such as Viking, a DC Thomson title that is being offered along with a authenticated script for the Scottish company's Starblazer title (Lot 165). New Eagle fans may also be interested in a 93 issue unbroken run of the title, offered in five bound volumes starring Dan Dare and The Mekon by Gerry Embleton, The Fist Of Danny Pike by John Burns, The Tower King, House Of Daemon and Fifth Horseman all by Jose Ortiz. 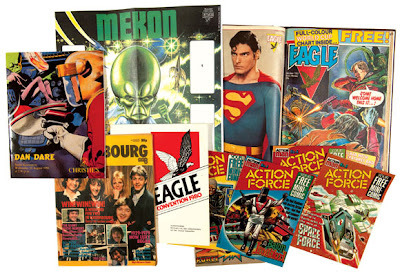 Included in the lot are free gifts Action Force Mini Comic 1-5, an Eagle Convention Programme 1980, Mekon poster and Bubbly World Cup Chart poster, a Matchbox Toys poster and several other toy posters and leaflets, plus a Boys And Girls Exhibition programme from 1962, a Radio Luxembourg 50 Pop Years magazine, Christie's Dan Dare artwork catalogue (1993), Eagle Days Remembered supplement (1994), Dan Dare At 50 (2000), a BT Dan Dare phone card and several other 1990s pieces. 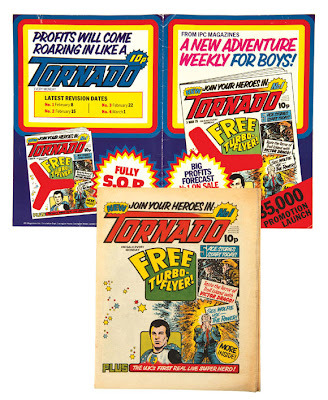 One of the star items in this catalogue is a Dandy Comic No 1 (Lot 30). Its grade is [gd+] and with the demise of the weekly print Dandy late last year ComPal know there will be strong interest in this scarce first issue. Several early Dandy comics from 1938 are also on offer. When the printers at DC Thomson checked the registration and colour of a comic before a print run the ‘printers' proof’ was signed off by the editor or his sub prior to printing. These unique pieces of DC Thomson history have never been seen at auction before and there are five Beano covers available at Lot 37. There are plenty more comics on offer too, including runs of Magnet and many more. You might remember that last March, artist Stephen Downey and others came up with the 'Creator Owned Day' Challenge, where comic creators would create a wholly new, creator owned concept and post it on their blogs, Twitter etc. The Challenge ended up a trending topic on Twitter (and indeed, has its own Twitter account), with lots of artists and writers taking part, readers celebrating their favourite creator owned books and, people like Steve Niles and Jimmy Palmiotti using the event to announce their Creator Owned Heroes book. Create a sketch of an original character or concept and and post it on your Blog, Twitter etc on Tuesday 5th March. It should be a concept completely owned by the artist (or co-owned with the writer/collaborators permission to post). 1. A lot of reader and creator focus is on characters owned by larger corporations. Let's bring a little spotlight on creating brand new, creator owned concepts. 2. Bringing a little awareness to the business side of co-creating original content. Take a look at Jeff Parker's 2012 article on co-creation and follow up comments on the subject. Co-creators can take this opportunity as a little trial run, just make sure to have a mutual agreement in advance. 3. Fun! A few creators discussed the idea on Twitter and thought it was a great opportunity to create something entirely new, while bringing attention to these sketches. 1. Create an sketch of a new character/character you own. The creators who set this up are doing this primarily to get their imaginations - and all other creators running, so a concept specifically created for Creator Owned Day is probably ideal. 2. It should NOT be a character owned by either a company eg. 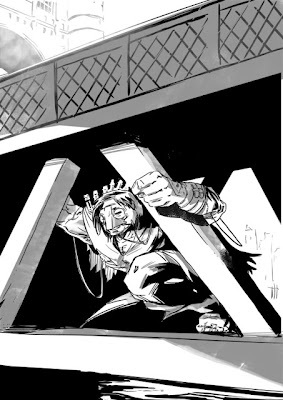 Marvel's Wolverine, OR owned by other creators e.g. Todd McFarlane's Spawn. It also shouldn't take distinct features from characters owned by others e.g. Wolverspawn You must own the character. 3. Post it on your blog, or Facebook, Twitter etc. 4. Share your post using the Twitter hashtag #CreatorOwnedDay. 5. Help spread the word by retweeting your favourite new characters. • You can follow Creator Owned Day on Twitter or Stephen Downey's own account on Twitter to see retweets of the best from the day. Here's more info on Stephen's creation from last year, the Troll of Tower Bridge, if you need a little inspiration. Alex Fitch talks to the directors of two new cutting-edge animated films which mix animation and live action footage to beguiling effect. Zoltan Sostai discusses his film Cycle, a spiritual successor to Tron and The Matrix, which sees an astronaut trying to escape a bleak urban landscape which twists and loops back on itself, creating a maze he can't escape. Also, British animator Paul Bush talks about his first feature film Babledom which looks into the layers of history and potential future that are unearthed by explorers of the modern city. 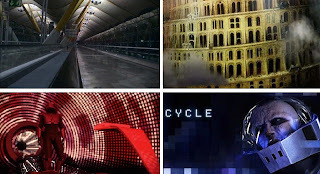 Cycle was released in Hungarian cinemas on 21st February 2013 following its London première at SCI-FI-LONDON in 2012 / Babledom is released in UK cinemas on 8th March 2013. 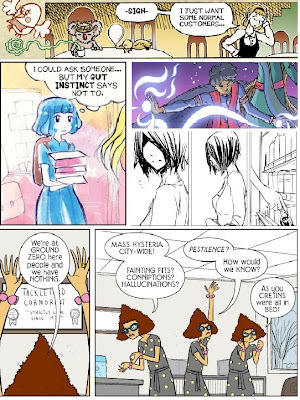 In the first of a series of shows looking at comics serialised on the internet, Alex Fitch talks to a quintet of young British webcomic creators about their work. In a Q and A recorded at Comica Comiket (2011), John Allison discusses his webcomic Bad Machinery, his reasons for choosing the internet as a form of delivery and the lessons he's learned as a comic book creator over the last decade. Also, at the end of the first Webcomic Artist Swap Project week (February 25th - March 3rd, 2013), Nich Angell (Cat and Meringue), Zarina Liew (Le Mime), Naniiebim (Mephistos) and project originator Richy K. Chandler (Lucy the Octopus), talk about their musical chairs experiment which saw thirteen creators write and draw each others' strips in order to bring new readers to stories they may not have previously encountered, and raise awareness of the British webcomic scene in general. 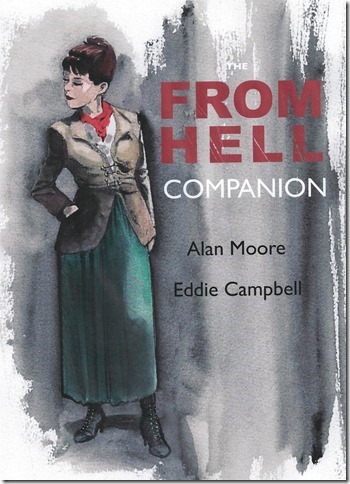 Alan Moore and Eddie Campbell's From Hell occupies a monumental place in the history of the graphic novel: a Victorian masterpiece of murder and madness which has won numerous awards, spawned a major Hollywood film, and remained a favourite of readers around the world for over two decades. In May, Knockabout Comics and Top Shelf Productions will publish The From Hell Companion, an astonishing selection of Alan Moore's original scripts and sketches for the landmark graphic novel, with copious annotations, commentary, and illustrations by Eddie Campbell. Included in the Companion for the first time are a set of pages, including some of Moore's greatest writing, which have never been seen by anyone except his collaborator. Joining them are Campbell's first-hand accounts of the project's decade-long development, complete with photos, anecdotes, disagreements, and wry confessions. Arranged in narrative order, these perspectives form a fascinating mosaic, the publishers say the book offers "an opportunity to read From Hell with fresh eyes, and a tour inside the minds of two giants of their field." MCM Birmingham Comic Con and Memorabilia, Britain's biggest collectors' event, come to the NEC on 16-17th March, and the team behind it tell us they have an awesome line-up of film and TV guests waiting to meet fans, host panels and sign autographs. Guests for their Comics Village area, with an emphasis on manga, include creators Josh Clarke, Kit Jo Yuki, Lily Mitchell, Lisa Cummins and Lyndon White; and indie publishers such as Subversive Comics, T Publications and Vimanika Comics UK. • For Doctor Who fans there's Colin Baker, who starred as the sixth incarnation of The Doctor, Nicola Bryant, who played his companion Peri Brown and Sophie Aldred, who was The Doctor's companion Ace. Other Doctor Who guests include Frazer Hines, who played Jamie McCrimmon in no fewer than 117 episodes of the show; Terry Molloy, best known as the Daleks' villainous creator Davros, and stuntman Jimmy Vee, who has played a host of monsters and aliens in Doctor Who and The Sarah Jane Adventures. • A trio of bold knights from Merlin will be at comic con: Alexander Vlahos (Mordred), Rupert Young (Sir Leon) and Eoin Macken (Sir Gwain). • Potter Personalities - Chris Rankin, who plays Percy Weasley in six of the blockbuster Harry Potter films, Steffan Rhodri, who was Reg Cattermole in Deathly Hallows and Hugh Mitchell, who appears as Gryffindor student Colin Creevey in The Order Of The Phoenix. Steffan is also famous for playing Dave in hit comedy Gavin & Stacey, and recently won plaudits as the voice of Drippy in acclaimed videogame Ni No Kuni: Wrath Of The White Witch. • Primeval stars Andrew Lee Potts (Connor Temple), Hannah Spearritt (Abby Maitland), also famous as an original member of S Club 7, and Lucy Brown, who played both Claudia Brown and Jenny Lewis. • Bond girl and Avengers star Honor Blackman. Other Bond girls at Memorabilia include Shirley Eaton (Goldfinger), Lana Wood (Diamonds Are Forever) and Maryam d'Abo (The Living Daylights). • Iconic glamour model Samantha Fox. As well as being the most popular pin-up girl of the '80s, Sam is a 30 million album-selling pop singer and actor. • Gary Dourdan, best known for portraying Warrick Brown in eight seasons of the massively popular CSI: Crime Scene Investigation. • Canadian actor Connor Jessup, best known for his role as Ben Mason in the Steven Spielberg-produced sci-fi series Falling Skies. • Masters of Horror - best known by his stage name John Morghen, Giovanni Lombardo Radice achieved cult status with his roles in 1980's Italian splatter movies such as Cannibal Ferox, City Of The Living Dead and Cannibal Apocalypse. He'll be joined at Memorabilia by scream queen Madeline Smith (The Vampire Lovers, Frankenstein And The Monster from Hell) and Eileen Dietz (The Exorcist). * The ‘Kids Go Free’ offer applies to General Entry tickets only. Children aged 10 years or younger gain free entry if accompanied by a full paying adult, to a maximum of two children per full paying adult. Vengeance, Hollywood heroes and Spoons? 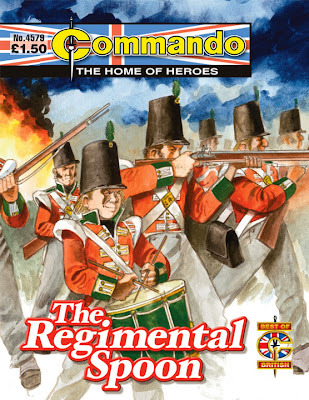 It's your latest Commandos! 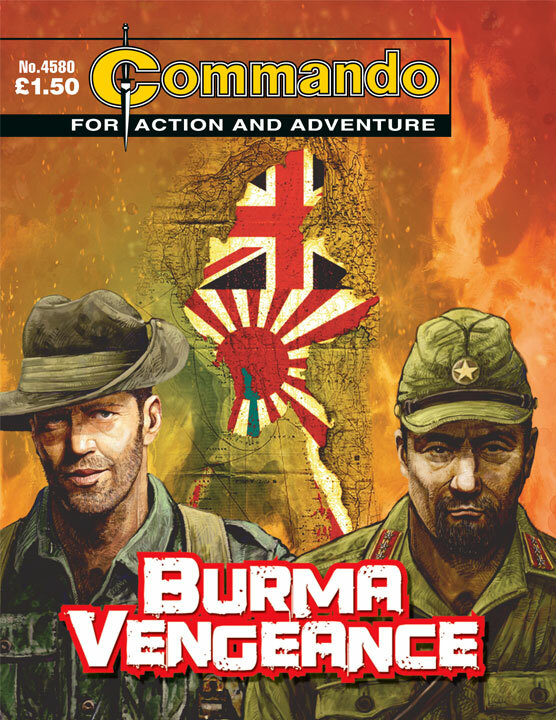 The latest issues of war comic Commando are on sale now in all good newsagents, and digitally via iTunes for iPad and iPhone. Here's the rundown - and you can now also read a preview of each issue and "try before you buy", via the Commando web site. Soldiers' lucky charms and mascots come in all shapes and sizes - from medallions to pet goats and all things in between. But surely one of the oddest objects to become a talisman of good fortune was a spoon. Yes, that's right, a humble spoon. Don't believe it? Well, between these covers is the story of how this kitchen utensil went to war with generations of the same family - and returned home safely every time. Make up your own mind if the tale is true. In the dense Burmese jungle, British troops were being driven back towards India, their spirits sapped by a series of defeats at the hands of the advancing Japanese. Corporal Dan Farley had been left in command of a group of fearful survivors. They expected to be killed at any moment…but then a grizzled veteran Sergeant - ruthless and tough - came of out of nowhere to save their skins. Dan wanted to be like this lethal newcomer, but the mysterious NCO was on a mission of his own. He had a score to settle with a brutal Japanese Colonel. This quest was personal and it could only end in death… but whose? Almost every man has a hero…the one bloke in all the world he'd give his right arm to be like. Corporal Joe Brent's number one he-man was the big, granite-fisted American film-star - Chet Marvin. In the days before the war, Joe queued up to see every movie he made, and marvelled at the sheer guts of the man. Then, one day in 1941, against a background of exploding German bombs and throbbing aero-engines, Corporal Joe Brent and his celluloid hero met face to face. It should have been the greatest day in Joe's life. "A little bit of 'conspiracy theory' never goes amiss in Commando and author Eric Hebden takes full advantage here with his invasion that never was," reflects editor Calum Laird on this reprint story. "The main thrust of the story, though, is a hero with feet of clay - or a bad case of the jitters - and he manages that with equal aplomb. "The art is strong, inside and outside, by two men who handle the drawing of horses with the same skill as Hebden handles the story. And horses, as the best of artists will tell you, are tricky beasts to capture. The French Char-B tank was one of the best fighting vehicles of the Second World War. But France had surrendered in 1940 so why were there a lot of them in the desert in 1943? And why did they have enemy markings? 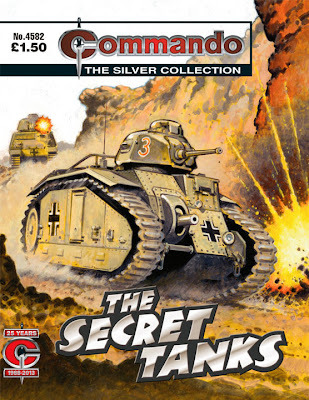 It was a secret which the Germans were determined to hide but which the Allies were equally determined to uncover. 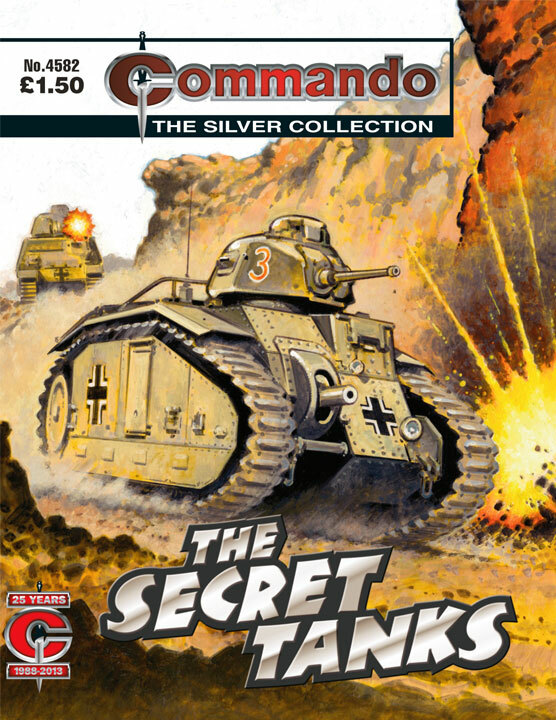 "This solid tale features a story-telling device that works well in Commando - the linking of World War II with the Great War which had ended a little over twenty years previously," notes deputy editor Scott Montgomery. "Here, the connection is a fighting father and son, and the dependable sergeant that served alongside them both. "Then, of course, throw into the mix the 'Secret Tanks' of the title - great, clanking French Char Bs - and we have a classic in the making. 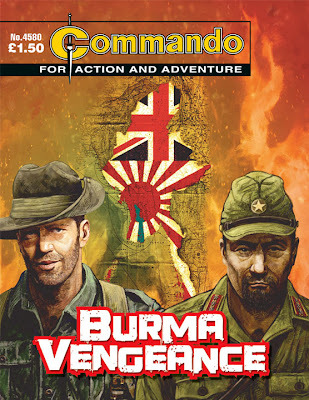 "Commando legend Gordon Livingstone's art is up to his usual high standard here, and shows his versatility in drawing action and adventure, whatever the conflict." Comic book artist Gibson Quarter - best known for his work on the 'War on Drugs' strips written by Alan Grant, and published by Wasted – reports the latest issue of Undertow (#3) will be released at the US Emerald City Comic-Con on 1st March. 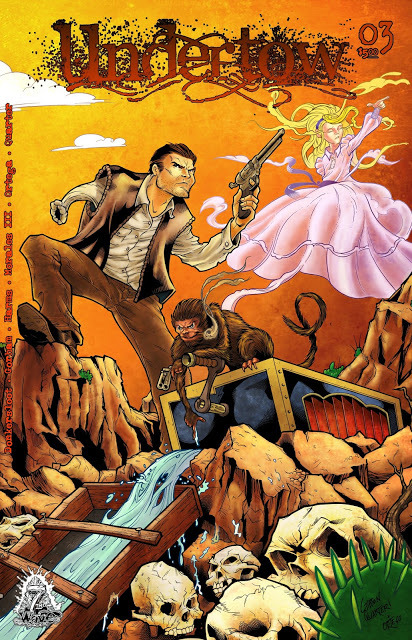 "It's been a while since the cliffhanger ending of the Organ Grinder story from Issue #2, and we pick it up right from there," he reveals. "This issue also marks the start of Adam Gorham's stellar art work on the other story in this comic 'The Forgetting'." The Undertow anthology project was started in 2003 by US creator Luke Donkersloo's childhood friend Derek Webster. After a long hiatus, Undertow #1 debuted in 2011 and is where Luke shares his storey. "It's an amazing learning experience as I create something that's given me an immeasurable amount of enjoyment throughout my life," he says." There's a five page preview of what you can expect on Gibson's blog here. "I'm inking myself on this one," he says, "but Guillermo Ortego helped out on the cover, which was wonderfully coloured up by Greg Harms." 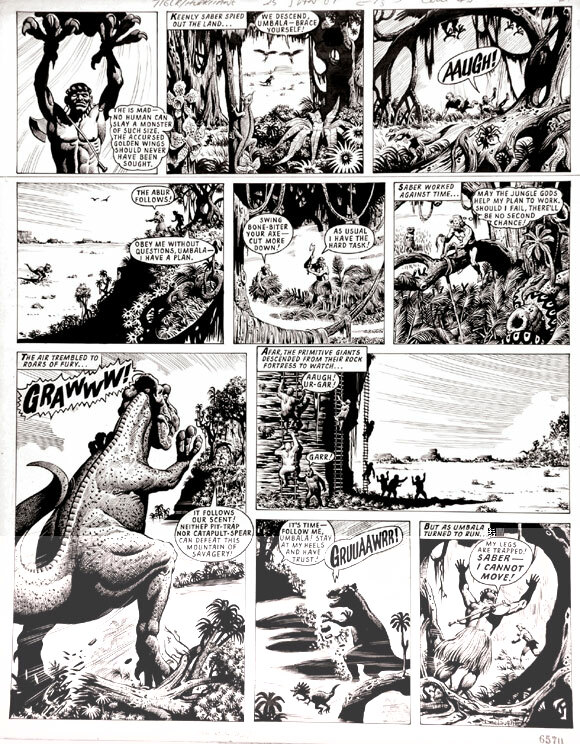 Gibson's work also includes strips for British indie titles Futurequake, Zarjaz and Dogbreath. • Undertow # 3 is also available to order (along with Issues 1 and 2) right now at the 7th Wave website. The annual Publish And Be Damned self-publishers fair returns for its second year to London's ICA on Saturday 2nd March. The fair features over 50 publishers with experimental editorial directions and distribution strategies operating outside the mainstream. While most involved appear to be non-comics related, the event will be of interest to creators looking at ways to distribute and market their work, whatever their content. Organised by Kate Phillimore and Louise O'Hare as PABD in association with the ICA, participants are The Block, OEI magazine / OEI Editor, Happy Sick Idle, Copy, Picpus, Limner Journal and Studio Operative, FUN Magazine / Ditto Press, Duke Press, The Grantchester Free Press, Mark Pawson, Wysing Arts Centre, Café Royal Books, X marks the Bökship, Daniel James Wilkinson, Copy, The Coelacanth Press, P.A.S.T. Projects, covered in toner, Nieves, P.E.A.R., Fillip, New Documents, Allotrope Press, MUTE, AND, Schizm, Art Licks, ESP/Eastside Projects, Michalis Pichler, Hard Mag, Onomatopee, The Everyday Press, T-R-E-M-O-R-S, Clod Magazine, Infinite Greyscale, [RHP] CDRs, Decadence Comics, Garageland/ Arty, Occasional Papers, Performance as Publishing, AMBruno, Sara MacKillop, LemonMelon, David Osbaldeston, The London Bookshop Map, Banner Repeater, SALT., Arcadia Missa, oomk zine, I am Dora. 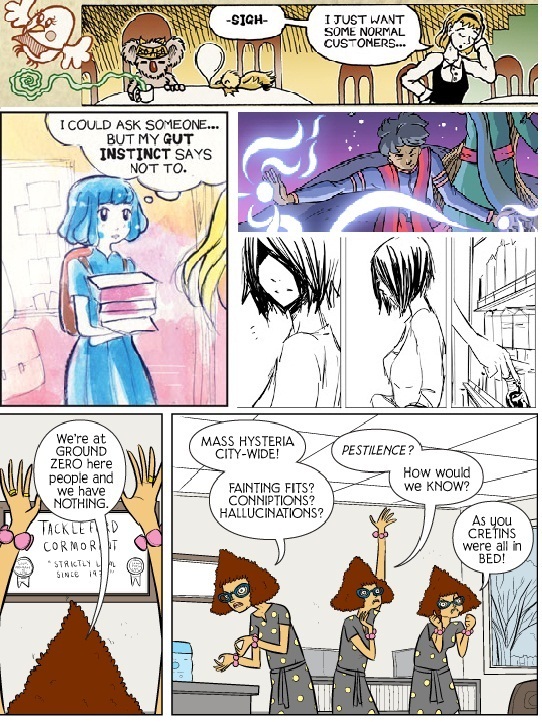 I am Dora, The Gym and The Alarmist. Artists videos are installed throughout the fair, playing with ideas of automatic writing and instant publishing and showing new work by Fiona James, Clunie Reid, Erica Scourti, Anne Tallentire, Duncan White and Camilla Wills. Reflecting upon practices of writing and distribution, and teasing out the relationship between experimental writing and publishing practices, this installation of silent video will serve as a starting point for talks and discussion at an upcoming ICA Friday Salon. Curated by Three Letter Words and Duncan White. Organised by Publish And Be Damned in association with the ICA. Special thanks to The Block. A panel discussion with Chicks on Speed's Anat Ben-David, Sean Dockray, architect of aaaarg.org and organiser of the LA branch of The Public School, and artist and writer John Russell, focussing on the relationship between publishing and academic research. Chaired by art historians Alison Green and Joanne Morra. 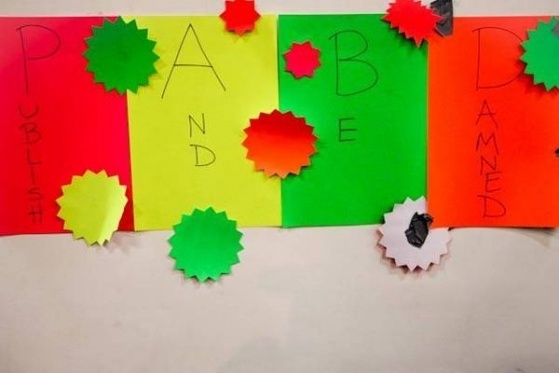 Organised by PABD/Three Letter Words in collaboration with the Practices of Writing and Publishing research group at Central Saint Martins and in association with the ICA. The talk in Cinema 1 is followed by a workshop in the ICA Studio. Participants will produce a publication that documents the events of the day and addresses such issues as the role of circulation and sociability in the 'production of knowledge' and the efficiency of alternative modes of writing and distributing art criticism. Workshop participants will join Central Saint Martins postgraduate students to produce an 'instant publication' that will be launched in the ICA Bar after the fair. Workshop run by Alison Green and Rebecca Harris. Organised by PABD/Three Letter Words in collaboration with the Practices of Writing and Publishing research group at Central Saint Martins and in association with the ICA. This screening brings together artists' films and videos in which typography plays a central role. The screening will look at how typography has been used to shape new aesthetic relationships between image, text and time, and how viewing moving image might be considered as a process of reading as well as looking. Selected by Fraser Muggeridge and Will Rose. Join us for DJing in the bar, plus readings from PABD members' publications, and the launch of I don't want to write a PhD - a publication based on the talk earlier in the day and produced as part of a workshop in the ICA Studio. 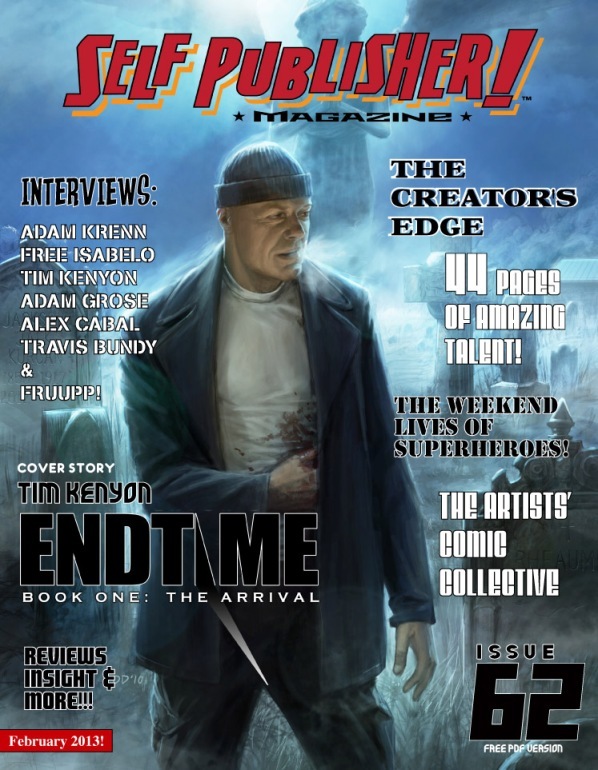 While the latest issue of Self Publisher Magazine - a free e-publication devoted to indie comics - is dominated this time out by US creators, it does include an extensive interview with British illustrator, writer and comic artist Adam Grose, creator of the amazing Cosmogenesis with Tony Suleri, talking to Darren Worrow about his career, his move away from Cornwall and his hopes for his career. Adam, a Fine Artist by profession, has been working on his latest project, a supernatural novella, for several years. "I began plotting a supernatural story that was originally going to become a graphic novel in 2009," he reveals. "I was about to submit it to Insomnia, when they folded. I had illustrated the first 28 pages, but I thought it might be interesting to see if I could write a novella instead. "I decided to follow this instinct and have spent the last three years, on and off, developing the plot further. "It's a supernatural tale that follows the lives of a couple - an architect and a designer - who uncover a hidden secret. "I don’t want to say too much at the moment, but it is a composite piece involving supernatural elements and it acts as a metaphor for our current times. It also embodies elements from certainconspiracies I’ve seen on the internet. I find these fascinating and they lend themselves to fiction very well." Self Publisher Magazine is a great title devoted to smaller publishers, offering some tasty previews of upcoming projects, interviews and practical guidance on self publishing, wherever you are based. The team are improving the look of the title each issue and are currently looking at launching a print edition via a Kickstarter campaign. Comic artist Lee Sullivan, whose latest published comics work is Doctor Who: Prisoners of Time #2 from IDW (read our interview), has dropped us a line about a SF audio project he's working on: The Minister of Chance. 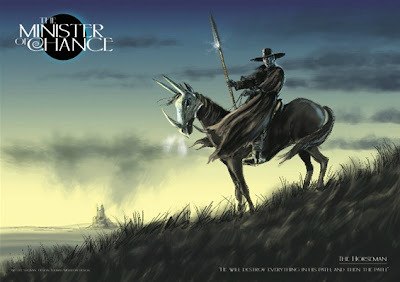 "The Minister of Chance is a crowd-funded continuation of the story of the character created by Dan Freeman for the first Who webcast Death Comes To Time, which he produced and wrote," says Lee. "I drew artworks for that, which were used for the accompanying animations. It's available free through iTunes. "The Minister was first played by Stephen Fry, now by Julian Wadham. There's a whole galaxy of Who and SF related actors involved (Sylvester McCoy, Paul McGann, etc.) and it's what they call a 'sonic movie'." The project has reached its fourth episode and is now sourcing backing to make episode five. "I draw occasional images for Dan to get excited about and to give another facet to an amazing project," Lee explains. "The series was nominated for the BBC Audio Drama Awards and I finally got to talk with David Tennant there. "A lot of us Chancers are going to be at BritSciFi3 event at the Space Centre in Leicester on 9th- 10th – so come along and say hello!" Lee has also been busy on another Doctor Who project recently. "I've just produced two Doctor Who posters which are going to be incorporated in a limited edition box-set of artworks connected with the series as part of the 50th anniversary celebrations," he reveals. "A version of my 'Usual Suspects' pic (with just the 11 TV Doctors) is one and the other is an entirely new piece, again featuring all the legit Doctors plus their TARDISes." We're sorry to report the passing of Raymond Cusick, designer of Doctor Who's Daleks, and we thank Nick Abadzis for giving us permission to reproduce his visual tribute, posted on his blog earlier today. While editing Doctor Who Magazine some 20 plus years ago now, I was lucky to encounter Raymond, and fellow early Who designer Barry Newbery, on several occasions. Both kindly opened their private archives to us, enabling publication of some early, previously unseen images from the very first Doctor Who adventures broadcast between 1963 and 1965. 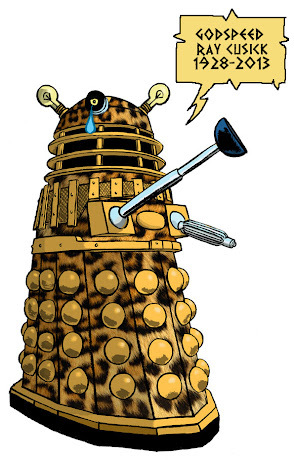 While writer Terry Nation and the BBC jointly shared in the revenues generated from the sale of Dalek merchandise, as a BBC employee working in the visual effects department (alongside Ridley Scott, among others), Cusick received little more than a small bonus, £100 if memory serves, for designing Doctor Who's most popular adversary. This cursory acknowledgment of his work by his employers at the time is one I am sure many comic creators down the years can identify with. Godspeed, sir. You will be remembered. You won't like what you see. Some turn into 'A' list celebrities with 'A' bomb fists. His eyes will reflect the rocket's red glare. 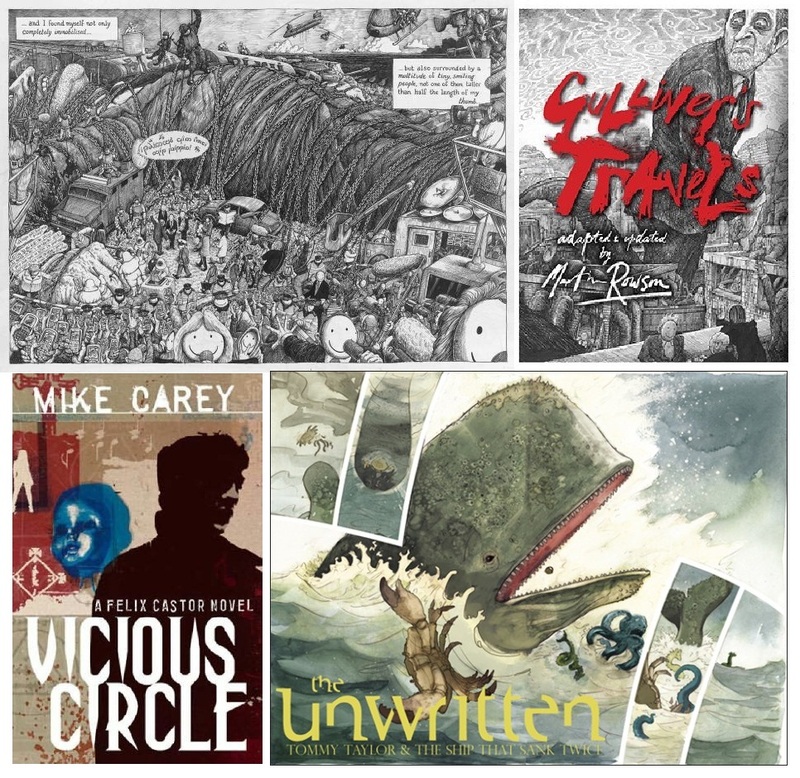 Concluding a month of shows looking at the connections between comics and books, Alex Fitch talks to a pair of authors who have used graphic novels and comics to update classic literature. Mike Carey discusses his comic The Unwritten which sees characters from classic literature - such as Frankenstein's monster - and authors - like Mark Twain - being caught up in a fantastical conspiracy through the ages; Alex and Mike also discuss how the latter's parallel career as a novelist effects his comic book writing. 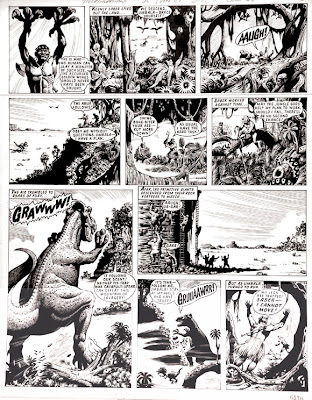 Also, newspaper cartoonist Martin Rowson discusses his graphic novel adaptation and updating of Gulliver's Travels, with its art and content reflecting current politics and situations.